We offer a effective and innovative Product Merchandising range that includes various types of hooks, cycle racks, carpet racks, mattress racks, dividers, pole star & bowl carousels. We have designed and created various merchandising products to meet the specific needs of our clients. 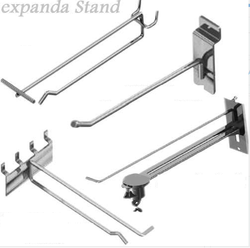 Expanda Stand carries a extensive line of Pole Star & Bowl Carousels to meet your particular needs. Choose our Pole Star spinner display system & create a display to meet your specific needs. 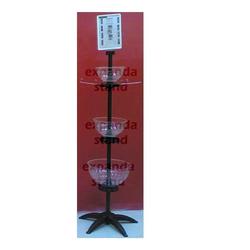 Bowl Carousels are one of attractive Spinner display system for promotional products. Our Spinner display systems are modular, flexible and easy to install. Place our Spinner Displays in high traffic areas, to draw customer attention & increase your sales. Shelf Management systems should be flexible & configurable for different product sizes. Our divider system stores and display products of variety sizes & shapes in a orderly manner of better inventory management. With gravity & feeder attachment, shelf dividers automatically delivers the products to the front of the shelf. We offer poly carbonate shelf dividers, wire shelf dividers, breakable shelf dividers and push back shelf dividers for various product applications. We offer a great range of effective & innovative display hooks for all applications. Our Hooks Merchandising are the easiest way to merchandise, saving your time & money. Depending on the type of mounting, we provide peg hooks, peg wall hooks, mesh hooks, slat wall hooks, multi-utility hooks and cross bar hooks. Depending on the type of application, we provide single stem Ball tip hooks, double Stem ‘T’ hooks, security lock hooks etc.